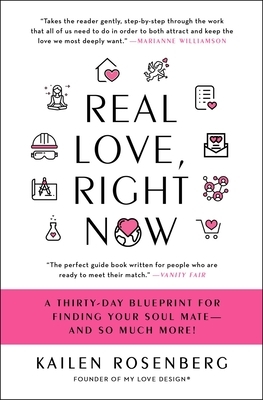 A Thirty-Day Blueprint for Finding Your Soul Mate - And So Much More! Real love is out there. Kailen Rosenberg will help you find it. From dedicated matchmaker, costar of the groundbreaking series Lovetown, USA, and relationship expert on OWN: The Oprah Winfrey Network, this proactive guidebook will help you get past the things preventing you from finding real, authentic love. Through a physical, mental, and emotional self-appraisal, which asks you to examine the things might be afraid to admit are holding you back, Kailen, lays out a fail-proof, step-by-step thirty-day plan that will make you love-ready and lead you to love. With 300 marriages to her credit, she is living proof that love and faith can overcome any kind of challenge. Her methods are straightforward, with unique exercises such as self-appraisals and love shopping-rooted in a spiritual understanding of love, which she sees as our highest calling. Real Love, Right Now helps you put bad dating habits aside so you can figure out what really matters and find the partner who is right for you. "It is no secret that Kailen Rosenberg knows the secrets of love. Now she shares them with everyone" (Keith Ablow, MD, psychiatrist, Fox News Medical A Team).